This easy to make curry contains creamy coconut milk, protein-rich tempeh (fermented soybeans) and nutritious turmeric to give it a golden glow. It’s vegan, made from whole fresh ingredients and a complete healthy meal. It will either serve 4 with rice or two with no rice and just the curry. 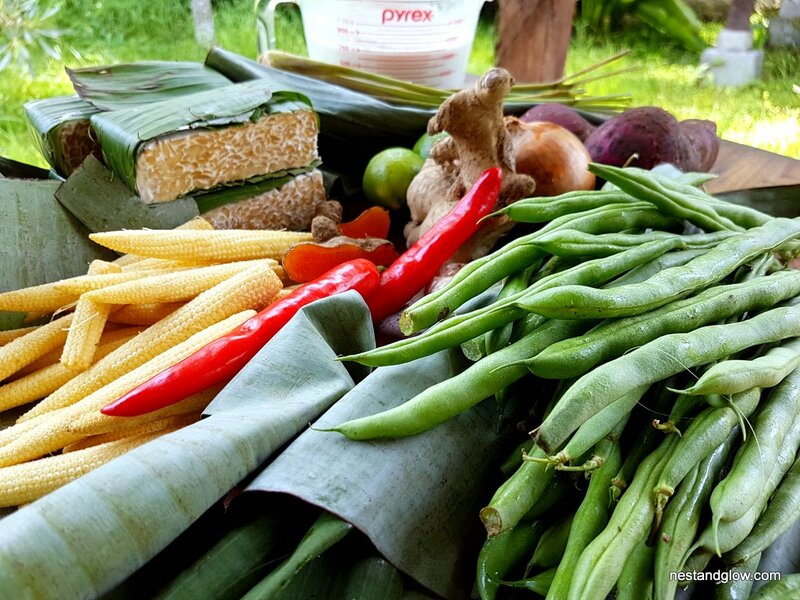 All the ingredients in this recipe were locally produced and purchased from the Ubud Food Market in Bali, Indonesia. 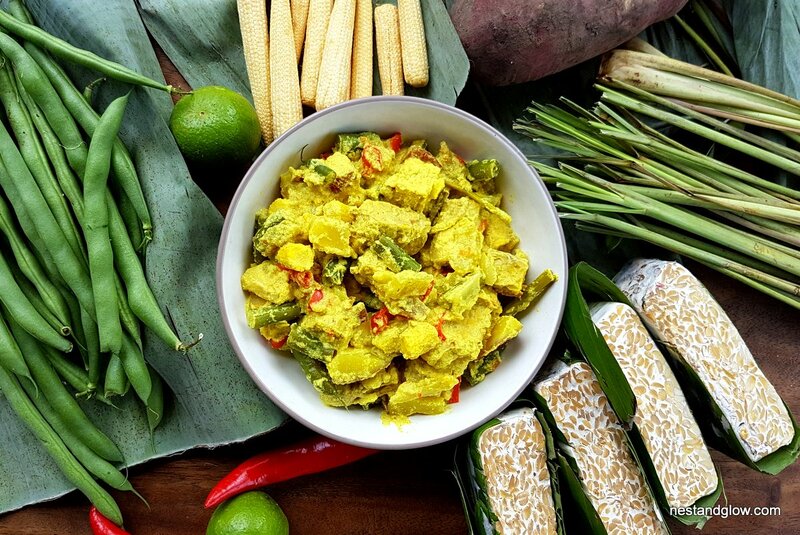 Tempeh is traditional Indonesian food and is readily available in the markets across the country and in health food shops in the UK. Traditionally tempeh is fermented by wrapping cooked soya beans in leaves of sea hibiscus. These leaves naturally contain a mould that makes the tempeh ferment. Tempeh was accidently created while making tofu when some beans were discarded and they fermented. Tempeh is said to be more digestible and bioavailable due to being fermented. It uses the whole soya bean so is higher in protein and fibre than tofu but does have a stronger flavour. Remove the hard shell from a mature coconut and grate. Soak the coconut in water, just enough to cover the flesh and leave for 2 hours or overnight in the fridge. Blend the coconut in a liquidiser or high-speed blender and then push through a sieve. Add the coconut milk, turmeric, ginger, garlic, onion and lemon grass to a pan and simmer for a few minutes. Then add everything else apart from the lime juice and simmer for 10 mins, with the lid on and stirring occasionally. Take off the heat then stir in the lime juice and serve. The fresh coconut milk still had a small amount of the thin brown skin, this is edible and contains nutrition and fibre so I left it on when grating. I’m totally fine with this and it makes no difference when making a curry but if you want a really smooth coconut milk then use a cheesecloth and squeeze the coconut flesh. In the photos and video, I used a white flesh sweet potato as they were the local variety. replace with a normal orange one or even a normal potato. For all the vegetables just use the ingredients as a guideline and use what is local and in season as it’s more economical and will taste the best. Apparently, Indonesians don’t like to buy coconut milk and instead make their own. So that is what I tried to do, hopefully, nothing was lost in translation from the directions a local gave me on how to make fresh coconut milk. 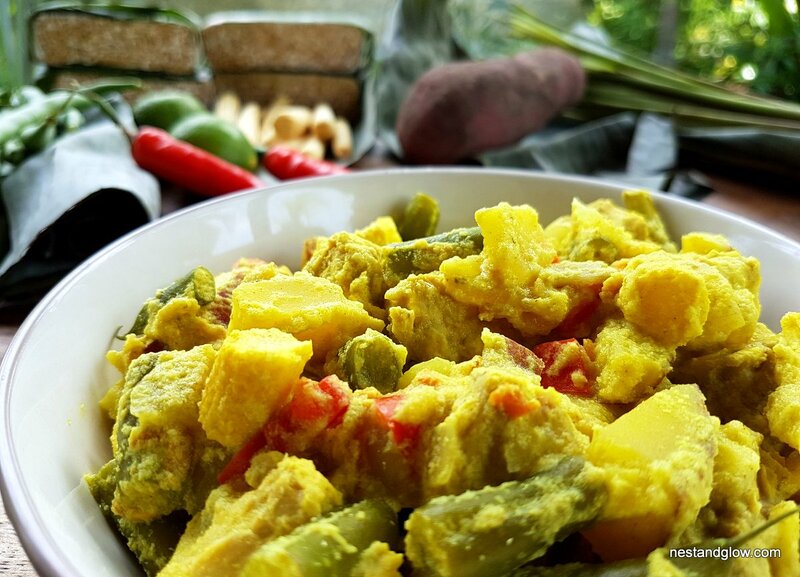 Feel free to substitute the fresh coconut milk with a tin and the fresh turmeric with a dried powder.